Left: Aghamusa Naghiyev (1849-1919), owner of the building which is now used as the Presidium of the Academy of Sciences. Owner: Musa Naghiyev (1849-1919), known as the wealthiest of all Oil Barons. 1918: Government House for the Azerbaijan Democratic Republic (ADR) In March 1918, during the tragic massacre carried out against Azerbaijanis, the palace was looted and gutted with fire by Armenian Dashnaks (nationalist revolutionaries) with the support of Bolsheviks (Communists) in their attempt to take control of the city. After the Bolshevik occupation, the Soviets rebuilt the palace, but they were not able to return it to its original state of splendor. Since 1945: Presidium of the Academy of Sciences. The exterior of the building is based on a Venetian palace in Gothic style. During the early Soviet period, Bolsheviks removed the Koranic verses from the facade and replaced them with Communist slogans and golden stars. When the Academy of Sciences moved there, the words "Academy of Sciences of the Azerbaijan SSR" were inscribed along the top of the façade. The large metallic gold stars and letters still remain, though the name of the building - Presidium of the Academy of Sciences - is now written near the entrance in Azeri Latin script and English translation (not Azeri in Cyrillic script and Russian). Originally, Ismayiliyya was decorated with excellent murals. However, most of them were destroyed. Today only the Main hall and the President's office are highly ornamented. The President's office is designed in the Mauritanian (Moorish) style, while the ceiling of the main hall bears traces of Gothic, Baroque and other European styles. Musa Naghiyev was born into a poor peasant family but managed to become the richest Azeri oil-industrialist of the pre-revolutionary period. He accumulated his wealth unimaginably fast, although like many of his contemporaries, he had apprenticed as a cargo handler. Naghiyev started to work when he was 11 years old. This palace, one of the most beautiful buildings in the city, was built in memory of his son, Ismayil (1875-1902, who at the age of 27 died of tuberculosis. Naghiyev had taken his son to Italy for medical assistance and was struck by the beauty of one of the palaces in Venice. Eventually, this building became the model upon which the Ismayiliyya was built. Naghiyev hired Polish architect I. K. Ploshko for the project. Construction was completed in 1913; but five years later, Armenian Dashnaks burned Ismayiliyya. This was a devastating blow to him since the palace had been built to the memory of his son. Within a year, at the age of 70, Naghiyev died of a heart attack (March 4, 1919), before the palace could be rebuilt. Even though Naghiyev has the reputation of being among the most miserly of the oil barons, he was also a philanthropist who financed several important buildings and humanitarian projects, including the "Sanitorium for Stomach and Intestinal Diseases" in Mardakan and three hospitals (known during the Soviet period as Semashko, Shamyuan and Khatai). Semashko, built in 1912, now bears his name - the Musa Naghiyev First Aid Hospital. The building is designed in the shape of an "H" (Cyrillic "N") for his name. As well Naghiyev was the primary sponsor and trustee of one of the largest male technical schools, Realni School for boys, which today houses the Economics University. Naghiyev became a millionaire unimaginably fast from his investment in oil. Fearing that he would lose his wealth as quickly as he had gained it, he began investing in real estate to guarantee himself a source of regular income. In total, he is credited with constructing 98 of Baku's buildings, each one more elaborate than the next. 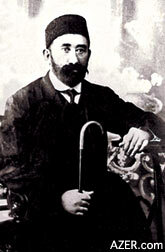 He became Baku's largest landholder. Although most of his buildings were not gestures of philanthropy, today it would be impossible to imagine Baku without these magnificent architectural landmarks.